September 13-16, 2018! Good luck and God Bless to all dogs, handlers, judges and volunteers at this year's Invitational! Post your stories here. Well, this was a popular topic, LOL! I realize some folks are probably just getting back and settled though. It looks like our chapter's dogs went 6 for 8 in earning Versatile Champion titles. And a couple other people I know had dogs earn VC. Congrats to all who ran, VC or not. ryanr wrote: Well, this was a popular topic, LOL! I realize some folks are probably just getting back and settled though. It looks like our chapter's dogs went 6 for 8 in earning Versatile Champion titles. And a couple other people I know had dogs earn VC. Congrats to all who ran, VC or not. Aren't the dice a bit loaded when you count Kyle Hough as a handler? All the same though, its a mountain of work for everyone to prepare. Congrats to all. Perhaps, but only 2 of the 6 dogs from our chapter earning VC's were client dogs. The other 4 were personal dogs of the handlers, including one of his VCs. No doubt our young chapter is blessed as all heck to have the amount of great experience and insight we have. Off the top of my head I believe we also have 7 judges in our chapter. The amount of time and dedication all handlers and judges put in is just amazing but you can see they truly enjoy it. Our chapter went 2 for 4. All 4 were great dogs. I worked with a couple all summer long, it was a great summer learning from handlers who are much better than myself. jlw034 wrote: Our chapter went 2 for 4. All 4 were great dogs. I worked with a couple all summer long, it was a great summer learning from handlers who are much better than myself. Congrats! Fun helping out with these dogs, isn't it? I know I learn a lot. I got sucked into NAVHDA by helping a guy train towards a VC. You can learn a ton by helping folks train for the highest level. Congrats to anyone who went, pass or no pass, it's a feat just to get there and a hell of a commitment to boot. 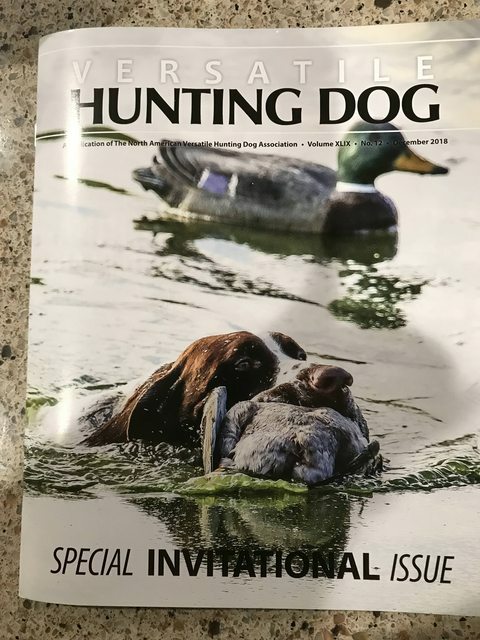 The Invitational edition of the Magazine arrived this week. On the cover is the GSP bred, owned, trained and handled by a Lady who trains with all PR, no ecollar, no FF. That dog was 1 year old when he earned a Prize 1 204 and 2 years old when he passed his VC. The dog has also earned an AFC title so not a low drive dog, just a talented cooperative dog in the hands of a very skilled and dedicated trainer. She has done similar work with similar success with this dog's granddam, sire, half siblings (also including SHR, FC titles) ... MythBusters could do an episode on her and her approach to gundog training. Who's the breeder? I don't get the magazine anymore.